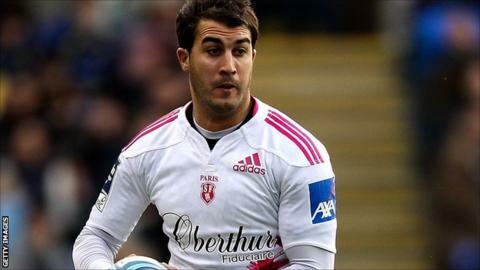 Stade Francais avenged last Sunday's loss to London Irish to earn a vital win in Pool Five of the Challenge Cup. The French side led 20-14 at the break with converted tries from Jules Plisson and Michael van Vuuren while Jerome Porical added two penalties. Irish's points came via an early try from Andrew Fenby as well as three penalties from Shane Geraghty. Porical converted his own try after the restart and Stade earned a bonus point late on through Antoine Burban. Stade Francais: Porical; Bonneval, Doumayrou, Bosman, Cocagi; Plisson, Kingi; Taulafo, De Malmanche, Attoub; Flanquart, Mostert; Burban, Rabadan (capt), Lyons. Replacements: Van Vuuren, Frou, Slimani, Van Zyl, Garrault, Dupuy, Steyn, Danty. London Irish: Lewington; Fowlie, Mulchrone, Armitage, Fenby; Geraghty (capt), Allinson; Parr, Mayhew, Halavatau; Rouse, Evans; Danaher, Low, Treviranus. Replacements: Stevens, Harris, Hagan, Skivington, Cowan, Sheridan, Dorrian, Hoadley.